The ESEO (European Student Earth Orbiter) is a micro-satellite mission to Low Earth Orbit developed, integrated, and tested by European university students as part of the ESA Education Office projects. ESEO is the third mission within ESA’s Education Satellite Programme and builds upon the experience gained with SSETI Express (launched in 2005) and the YES2 tether and re-entry capsule experiment. The satellite's mission is taking pictures of the Earth from orbit, measuring radiation levels and testing technologies for future education satellite missions. The educational component is aimed at providing students with valuable and challenging hands-on space project experience in order to contribute to prepare a well qualified space engineering workforce for the future. ALMASpace, Italy, is the industrial System Prime Contractor and is managing the ESEO project. In coordination with the ESA Education Office they provide system-level and specialist technical support to the student teams during the development and execution of the project. The spacecraft subsystems, payload and ground support systems are provided by student teams as part of their academic studies. To take pictures of the Earth and/or other celestial bodies for educational outreach purposes. To provide measurements of radiation levels in Low Earth Orbit. a microcamera developed by DTU Space, Denmark. Dedicated sensors (a Langmuir probe and a TriTel three axis dosimeter to measure the absorbed radiation dose, the dose equivalent and the LET spectra of the cosmic radiation), developed by University of Budapest, Hungary. ESEO serves as a test bed for a student built S-band communication system by the Wroclaw University of Technology, a GPS receiver for orbit determination developed by the University of Bologna, an AODCS software experiment coordinated by Delft University and a de-orbiting payload built by Cranfield University. AMSAT-UK provides an amateur radio payload called FUNcube 4 consisting of a 1260/145 MHz FM transponder and a 145 MHz BPSK telemetry beacon. ESEO has a mass of 40 kg and measures 33 × 33 × 63 cm. It is powered by body mkounted solar cells. 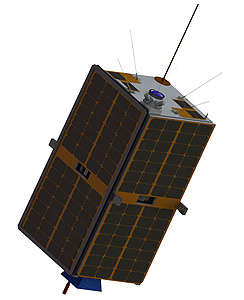 After entering Low Earth orbit, the ESEO satellite's mission has a planned minimal life time of six months, with the possibility of an extended mission afterwards. It will use a Sun Synchronous, meaning that it will always cross the equator at about the same local time every orbit, and its maximum altitude will be no higher than 600 km. After concluding its mission, ESEO will deploy a drag sail being supplied by Cranfield University, UK, similar to the one tested in TechDemoSat 1. This will inrease the drag to ensure that ESEO re-enters and burns up in Earth atmosphere faster. ESEO was a candidate to launch on one of the VERTA test flights of the Vega launch vehicle. The satellite is to be launched into Low Earth Orbit (LEO) in 2015–16.